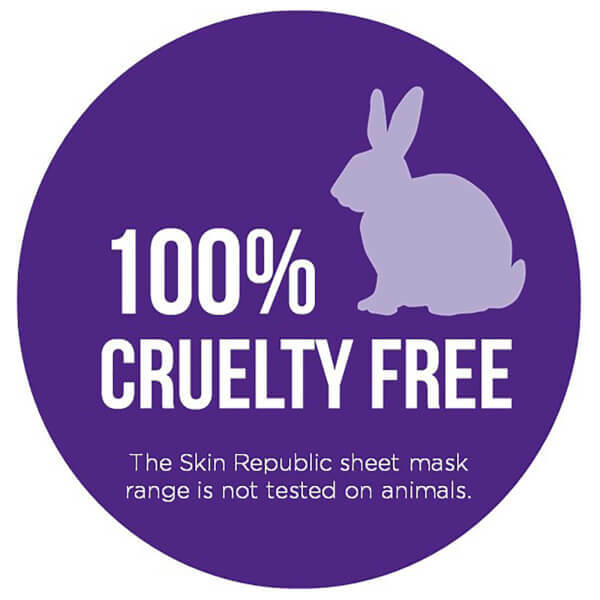 Improve the appearance of your skin with Skin Republic YouthFoil Face Mask, a serum-infused foil sheet mask saturated with a skin-restoring serum to help nourish the complexion whilst tackling signs of ageing. 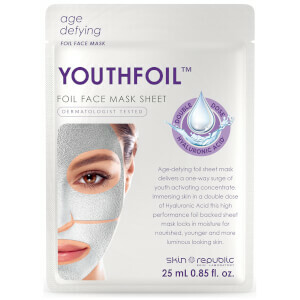 Encouraging quicker, more effective delivery of ingredients, the age-defying foil mask is coated in foil to help prevent evaporation whilst speeding up absorption, and contains a double dose of Hyaluronic Acid to moisturise and plump the appearance of skin. The concentrated serum intensely hydrates and nourishes to promote younger-looking skin, and its blend of Collagen, Elastin and Vitamins C and E effectively hydrate, reduce signs of ageing and protect against environmental pollutants. Sheet masks are an effective delivery system for ingredients, allowing nutrients and nourishment to penetrate deep down for maximum efficacy. After use, skin appears smoother, radiant and youthful. Dermatologist tested. Not tested on animals. ALLERGY WARNING: Contains Peanut Oil. Cleanse skin. Remove mask from packaging. Unfold and place onto face. Wear for 10 minutes. Remove mask. Do not rinse. Excess serum can be applied to neck, décolletage and hands. As the skin has a 4-week regeneration period it is most effective when used twice a week for the first month and then as required. To ensure skin compatibility, it is advisable to test a small area of the skin before use. Use the mask immediately after opening to prevent essence from drying out. Aqua/Water/Eau, Butylene Glycol, Glycerin, PEG/PPG-17/6 Copolymer, Betaine, Triethanolamine, Carbomer, Punica Granatum (Pomegranate) Fruit Extract, Allantoin, Panthenol, Peg-60 Hydrogenated Castor Oil, Hamamelis Virginiana (Witch Hazel) Leaf Extract, Chondrus Crispus Powder, Disodium Edta, Hydrolyzed Collagen, Adenosine, Tocopheryl Acetate, Actinidia Chinensis (Kiwi) Fruit Extract, Biosaccharide Gum-1, Ethylhexylglycerin, Sodium Hyaluronate, Methylparaben, Phenoxyethanol, Propylparaben, Parfum/Fragrance.